This sweet smelling brown sugar body scrub will polish away dead skin cells and promote circulation to reveal softer, smoother, glowing skin. Oils of Coconut and Sweet Almond hydrate and restore moisture to your skin. 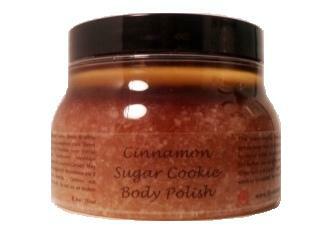 The warm scent of cinnamon lingers on the skin long after your shower is over! Ingredients: Sucrose (Brown & White Sugar), Cocos Nucifera (Coconut) Oil, Prunus amygdalus dulcis (Sweet Almond) Oil, Theobroma cacao (Cocoa) Powder, Cinnamomum zeylanicum (Cinnamon) Oil, Tocopherol (Vit E), Natural FragranceDirections: Stir before use and gently massage into damp skin. Rinse and pat dry. Suggested use once or twice a week or as needed. Not intended for use on the face.